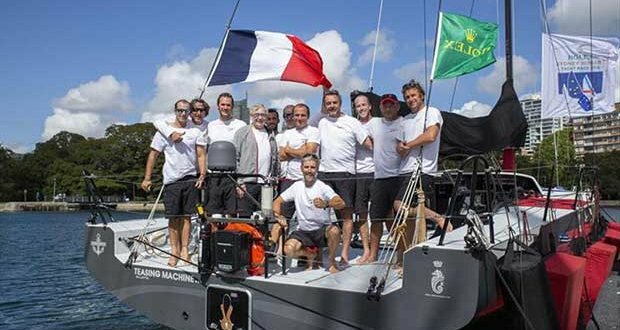 Eric de Turckheim, with his La Rochelle and Lorient crew plus one Italian, came to Australia to achieve a childhood dream to win the Cruising Yacht Club of Australia’s Rolex Sydney Hobart Yacht Race. Having been so close in 2015, when Hobart’s famous River Derwent decided otherwise and instead finished seventh overall to win Division 3, the French ‘Dream Team’ have a second chance. Make no mistake, de Turckheim is here to win the race overall and sees his name on the Tattersall Cup. “There are three or four classic races around the world that every sailor worth his salt wants to win, and the Sydney-Hobart is one of them, because it has such a rich history and made us dream when we were kids,” de Turckheim says. Launched in July 2017, the new Teasing Machine, an NMYD 54, has is ready to take on the TP52s. She has already participated in various races and finished third overall to win her division in the 2017 Rolex Middle Sea Race and won the RORC Transatlantic Race. Of course, Teasing Machine was designed and built for grand prix performance, but another key factor is de Turckheim’s crew combination. “The most important thing for us is to keep a friendly spirit and a sense of camaraderie. We are not just anonymous pawns on a board; we have known each other and sailed together for a long time. The French yachtsman is well aware that the competition is extremely tough this year including the 10 other international entries taking part, but he remains undaunted in his quest to win the 628 nautical mile race.